A Snake Hunter's Search for 'Lowly Things' Venomous snakes bite thousands of people every year. Kate Jackson survived a bite and has written a book — Mean and Lowly Things — detailing her journey from a Canadian childhood to a life chasing snakes in Central Africa. Venomous snakes bite thousands of people every year. Kate Jackson survived a bite and has written a book — Mean and Lowly Things — detailing her journey from a Canadian childhood to a life chasing snakes in Central Africa. Every year, thousands of people around the world are bitten by deadly, venomous snakes. Many don't survive to tell the tale. Kate Jackson did. She's a Canadian biologist who routinely handles dangerous snakes in the wild. NPR's David Malakoff has the story of how a kid from Canada ended up chasing snakes in the swamps of Central Africa. DAVID MALAKOFF: Sightseers don't get to go down in the basement of the Smithsonian's Natural History Museum in Washington. That's where they've got the giant cabinets, crammed with fossils and stuffed birds and pickled animals. But scientists, scientists like Kate Jackson, they do get to visit, and recently she was down in the basement doing some research and looking for the snake that nearly killed her a few years back in the Congo. KATE JACKSON: It's a medium-sized forest cobra, smooth, black, with quite a lot of fight specks. MALAKOFF: The cobra is dead now, coiled up in a glass jar full of alcohol. MALAKOFF: Three feet long, velvety black, banded belly. JACKSON: So when it rears up and spreads its hood, you see bands of bright yellow, which are now kind of faded. MALAKOFF: The last time Kate Jackson saw this cobra, it was late 2006. She was on a collecting trip in the Republic of Congo. Near the end, she visited a remote village. A big crowd gathered as she searched for frogs and snakes in a big pile of bricks. JACKSON: A big scream from somebody, and I saw a coil of snake. I couldn't see the head. I couldn't see the tail. What I could see was that the coil was disappearing fast into a hole. MALAKOFF: It looked like a common, harmless variety. JACKSON: Obviously not wanting this coil to disappear into a hole, after all those bricks I'd move, I grabbed hold of it and pulled it out. MALAKOFF: That's when she realized she was holding a forest cobra. JACKSON: I mean, it's not the way you handle a venomous snake is by picking it up around the middle. I couldn't let go of it in the midst of a crowd of kids, so I just tried to, as quickly as possible, shift my grip to control the head. About the same time, it opened its mouth to strike, and I saw the fang prick my thumb, and there was venom running all down my arm, viscous, yellow. Then I put it in the snake bag. MALAKOFF: Obviously, Jackson survived. You can get all the details in a new book she's written. It's called "Mean and Lowly Things." She asked me not to spoil the story of how she sidestepped death, but I can tell you that it involves a dash of salt, a really long hypodermic needle and some maggots that had burrowed under her skin. These days, Kate Jackson teaches biology at Whitman College in Washington State, but she says if you want to understand how she ended up in Africa chasing snakes, you have to go way back to when she saw her first snake in the wild. She was five years old, playing at the beach. Her sister was using a sieve to scoop up water. JACKSON: And without realizing it, she scooped up a juvenile northern water snake and dumped it on my leg. I was a juvenile; it was a juvenile. We were both terrified. MALAKOFF: That terror gradually turned to fascination. She became captivated by snakes, by their exotic colors, their habits, and as a teenager, she got a job running a small reptile collection in Toronto, her hometown. Her help included a couple of ex-convicts on work release, and the budget, it was tiny. JACKSON: One of the things they economized on was the lids of the cages, and things were always getting out. I particularly remember the California king snake, which luckily I found because it was wrapped around the toilet roll in the ladies' room. MALAKOFF: Jackson ultimately earned a doctorate from Harvard, and she got a little money to do some field research. JACKSON: I looked through an atlas, and I found myself drawn to Central Africa, the forests of the Congo River Drainage Basin, mostly because it was so poorly known, a black hole on the herbicological map. 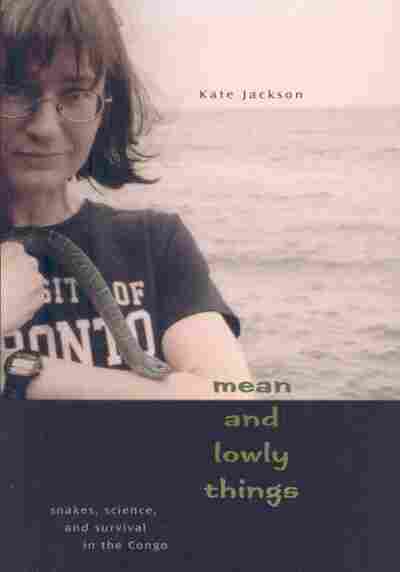 MALAKOFF: Kate Jackson doesn't look like a person who would seek out hardship. She's small, almost birdlike, but she's also determined. She wanted to join a grand scientific quest, the quest to describe, name and understand every reptile and amphibian on earth and maybe discover some new species along the way. So she headed off into some very tough terrain. JACKSON: It's really flooded forest, you know, trees standing up out of the water. You can't get a GPS signal because the tree cover is so extreme. You don't get sunburned because there's so little light getting through. Your clothes never dry on the line. You're wearing wet clothes the whole time you're there. It's just relative degrees of wetness. MALAKOFF: There were lots of snakes in the forest and in the surrounding villages, and she let local people know that they could get a reward if they brought her specimens. JACKSON: I clearly remember being woken at dawn by some fishermen who had speared on a tri-pronged harpoon a venomous vine snake, and the harpoon would be maybe 10 feet long, and he'd be at one end of it, brandishing in my face this very angry snake punctured in three places, me searching around, trying to find my glasses somewhere. MALAKOFF: Jackson traded a couple of ball-point pens for that vine snake. She says they were one of her most popular barter items. Those pens also helped her collect a journal full of memories, and then there are the hundreds of snakes, neatly coiled and folded in glass jars in the basement at the Smithsonian. JACKSON: You go in the collection there, they've got 570,000 specimens, a story in every jar. MALAKOFF: This month, Kate Jackson is headed back to the Congo to bring back more stories and more snakes, but she's not interested in having another near-death experience. JACKSON: I hope this time that fewer things will go wrong that went wrong last time. That's success. MALAKOFF: David Malakoff, NPR News, Washington.